This morning, Peter Orzag’s impending resignation caught my attention; but a headline about ironing boards in the Washington Post awakened my curiosity. Reader comments spurred further thoughts. In spite of the usual descent into a reckless hash slinging competition, I found some tasty bites along the way. References to IIT inspired me to add my own two cents. My reactive comments included questions I had not seen addressed –either by readers or in the original author’s complete circle of points identifying the challenges and options the Indiana manufacturer faced in its quest to keep its 200 remaining jobs. In my tweet of the story, I put out a call for innovation to rescue the company. I also thought I’d take a few more minutes to quell my increased curiosity. Who was Home Products International, HPI, other than the Chicago based parent company? Being privately held since 2004, I checked out the hedge funds who bought them. Neither the majority stake holder, Third Avenue Management, or HPI, struck me as holding ideas painted in the original article as typical of American manufacturers –e.g. eager for protection in the face of the inevitable onslaught of globalism. What exactly did a value based investment company such as Third Avenue find valuable enough to acquire a company painted as nearly doomed by The Washington Post article? I persisted in my cursory research with the intent to assemble a case study to share with future clients; or better, I might include HPI as a prospect or future client. Increasingly, I found it harder to reconcile the article’s attributions of the Indiana company’s image and management team with what I was reading on the home pages of the investor holding company or that of Home products itself. HPI is an international consumer products company specializing in the design, marketing and manufacture of quality, innovative housewares products. Take a look, judge for yourself! a rotating axis that matches the human torso? The suggested retail price is $99, currently exclusive at Bed Bath and Beyond for $129…a far cry from the simple $7 variety mentioned in the Post this morning. I tried reaching the Indiana plant this morning to learn just which of the 20 varieties of ironing boards available they manufacture. I count a voice mail asking to leave a message so I don’t have the answer. How and why it is that The Washington Post chose this little Indiana ironing board manufacturer to profile this morning, I don’t know. Certainly, there are lots of little towns with small plants struggling to survive. The article suggests futility when choosing to innovate using traditional approaches that lower costs by introducing process efficiencies, or streamlining distribution or economizing along their supply chain. In the battle to equalize the basic costs, against emerging economies like China, India or any of the Central and S. American countries, these little American plants wont’ be able to survive using these tactics alone. Should the US continue the artificial supports that tariffs offer but complicate larger trade relationships? These companies need to find the means and show themselves as competitors who lead not merely follow. They need to use some of their more promising tools in the innovation box…such as a new business model, or as HOMZ demonstrated product innovation that inspires us a little. 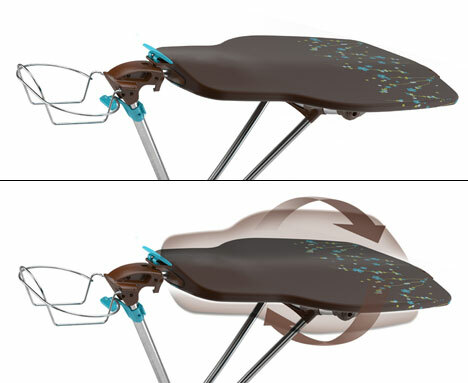 Home Products new ironing board inspires me, renewing my faith that positive rewards flow to those who innovate in the full sense of the word. Does it inspire me sufficiently to buy a replacement for my standard 30-year-old model? Well, not yet. I haven’t been able to track down whether it is or isn’t manufactured in the US. I know that it’s price tag is far from the $7 quoted in the article; which I did not find for sale at Target …their lowest price model is $23.99 online. Using Google as my first research tool, I inadvertently discovered that Williams Sonoma sells a very high-end ironing board for $180 manufactured by Brabantia, a Dutch company with locations all over the globe. Relative to the HOMZ product, it offers a resting shelf for completely ironed and folded items…not really revolutionary, and not reason enough for me to spend an extra $172. If I want to buy American, keep jobs and help the economy I still have some research to do. The questions for the policy makers trying to sort out these issues requires that we all learn more about the ironing board business, and how to find the equilibrium between creating or maintaining some domestic jobs based on innovation! I’m open to suggestions. This entry was posted in Decision Making, Design, Energy, Public Policy by arjkay. Bookmark the permalink.